I decided to start in on the newbie Epic Arc: The Blood-stained Stars. Of course, getting to Sister Alitura in Arnon presented a minor inconvenience. I wanted to relocate a few ships from Trossere, and while it is easy enough to “Set Destination” and fly out on auto-pilot, it takes time. As in, 20 minutes one-way. Yes, I timed it. I wanted to take my Catalyst, Imicus, Tristan, and Iteron. 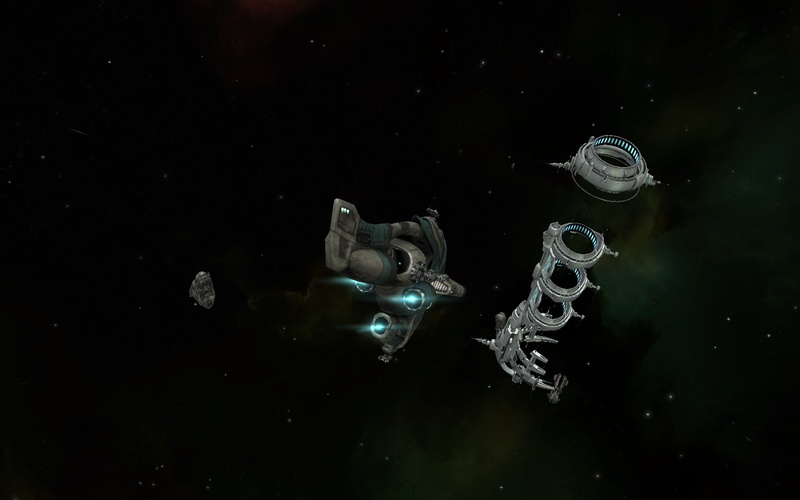 I was going to package each ship up and transport them with the Iteron, but it turns out that voids insurance, and I had a policy on each ship. Hmmm. So I wound up flying a ship out, leaving, and returning to Trossere in my pod, and repeating for the next ship. While I was doing all this, I used to market to find some skills books and items I wanted to buy. Now I have Salvaging and will train it so I can be more effective looting NPC ships I defeat. 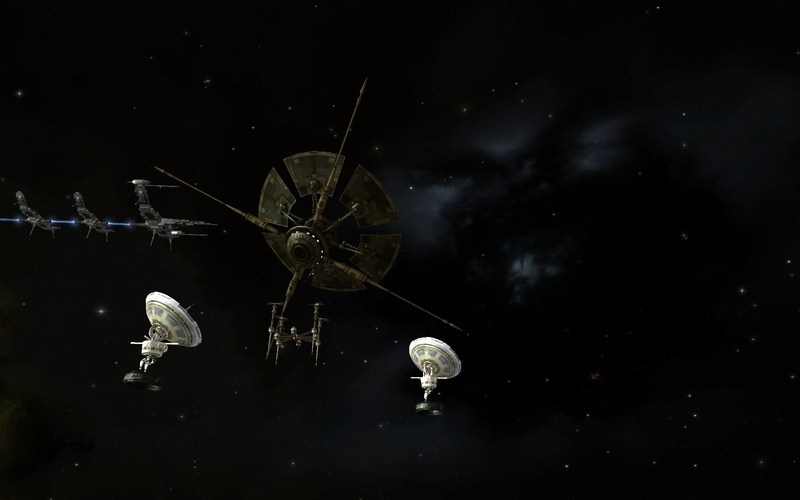 I found a great write-up of Blood-stained Stars (BSS) at the Eve University site, and am thrilled with how much each missions pays, ISK-wise. Yes, I know, you with the multiple space stations in null sec, choosing between a different Titan every day to fly, scoff at a measly 150K ISK (on average). For me that is a lot and I could use the cash to buy equipment, skills, and other stuff I need as a relatively new player. 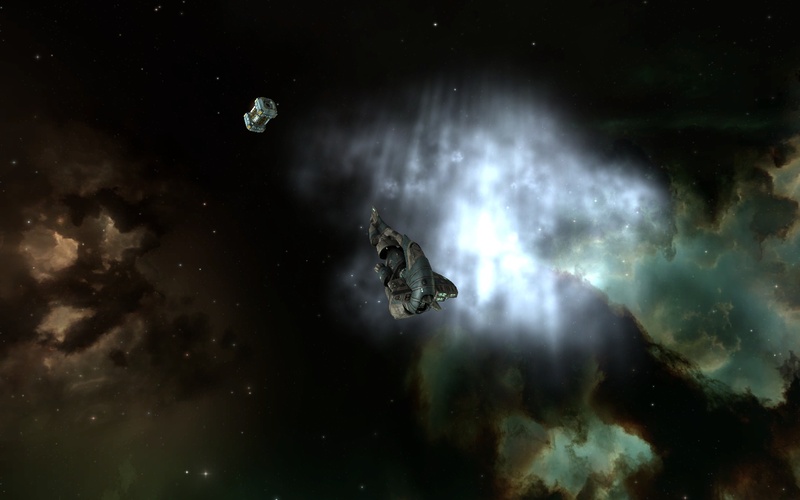 So I’m pretty happy CCP has something like that in the game, a gentler extended intro to the game past the tutorial missions. I started in and am currently on Mission 17: House of Records, which actually is on a section of the story which is at another system entirely – Hatakani. I started BSS in my Tristan, but after a few missions that required running away to repair and return, I decided it was time to switch up to the destroyer: The Catalyst. 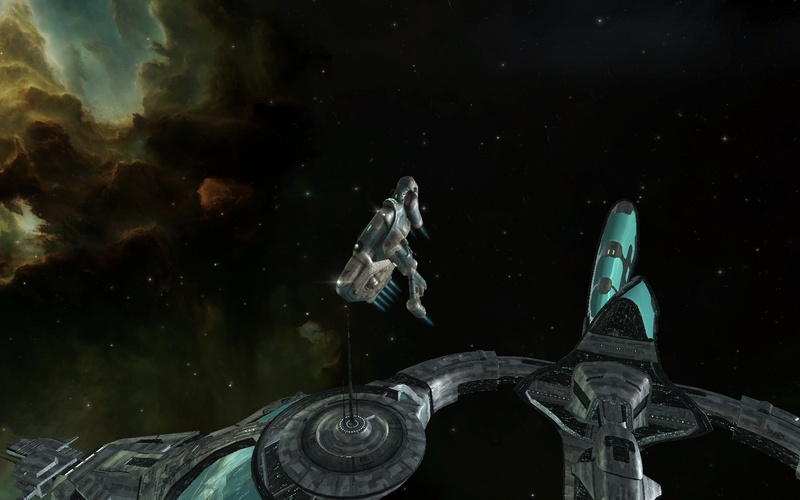 I found a mission fitting, from the Eve University site (can you tell I really like that site? It’s got tons of great info for players like me). I followed it pretty close but plan to experiment with different components as I get more familiar with what is available. The Catalyst is now my missioning ship. While at each station playing through the BSS, I made a note of Agents available to me. I’ve seen a few Distribution Agents (courier missions), and even a Research Agent. I bookmarked a few systems with a mental note to come back for some missioning variety! I’ll need to bump up my status with various agents in order to get higher level missions. It’s been about a month since I restarted EVE, and I got an email saying my initial period was almost expired. I decided to renew on the 3-month plan, and am looking forward to more adventures. I chat with my coworker that plays and hope to find something we can do together that I wouldn’t be totally unable to participate in. I just love the graphics in EVE Online – every station look awesome in my opinion. The military missions went pretty quick… fighting pirates was something I remembered pretty well from the first time I played EVE. In fact, I sped right through to the Advanced Military sequence, which were new to me. This sequence had me try out different equipment: Civilian Remote Armor Repairer, Civilian Shield Booster, Civilian Web Stasis, Civilian Afterburner; all provided by the tutorial. The point of these missions was to introduce/familiarize players with these items, which have use in PvP situations, both offense and defense. The tutorial sequence also had me do two (!!) suicide missions! One was to stay in a fight until the end, and warp out in my pod, and the other was to deliver and explosive ship to pirate headquarters. At the end of the Advanced Military missions, I received a destroyer – the Catalyst! So I did some market searches and flew around 4-8 hops to get lower prices. I’m still amazed at the graphics on ships and stations in this game, they are all great looking to me! I wanted to wrap up this mission sequence, so I was back at it the next day. The next mission was to manufacture Cap Boosters (not sure what they are for). I had enough materials leftover from previous mining and reprocessing, I didn’t have to mine more. I completed this quickly after running the blueprint twice. Surprise, surprise, the followup mission was to deliver the Cap Boosters. This was straightforward: after loading the cargo (haha, that would be classic error #1, forgetting to bring along the cargo you are supposed to deliver! ), setting my destination, I flew there with no incidents. It was only 1 jump away. After returning to Caille University, the agent offered me another manufacturing task: build a Civilian Gallente shuttle. It looked like that’s all I had to do for this part, build it. When I clicked Accept, EVE warned me the shuttle takes up 500 cubic meters, while my current ship, the Navitas, was too small. Well, I figure I’ll deal with that later. A quick check of materials showed I was short: I needed 3167 cubic meters, but only had 1522 cubic meters. Time to mine more Veldspar and then reprocess that. I undocked and realized I wasn’t sure where to go for asteroids. I fiddled with the overview and switched it from “General” to “All” and found something labeled as an Asteroid Belt, so I warped there. And… saw nothing. I swiveled the camera all around and nothing. Did Asteroids move around like Exploration sites? Was I supposed to scan as in Exploration, for asteroids to mine? Hm…. I figured the best option was to punt and just buy a little Veldspar from the market. I couldn’t find any so I search for Tritanium. That pulled back dozens of hits and after spending a little ISK, I had enough to make the shuttle. The 9th mission in this series is to draw out a spy by mining, and then fighting when the spy/pirate shows up. So, I need to fit a weapon and a mining laser. Since my Navitas already had all that fitted, I just used it. 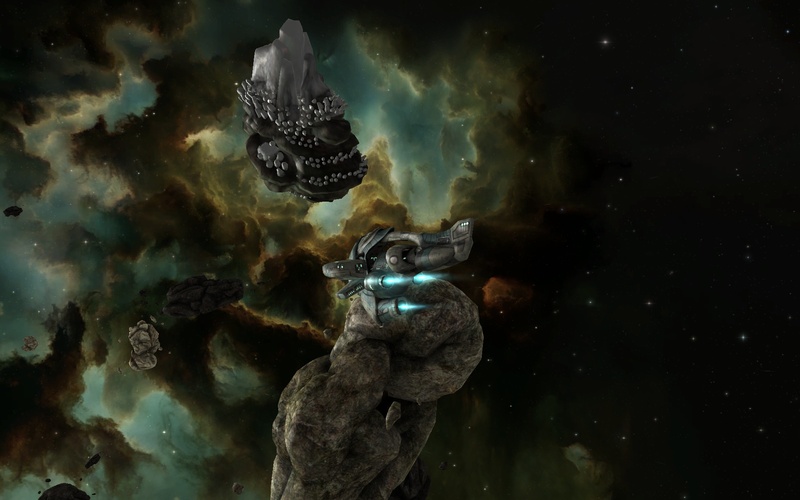 After mining one asteroid and moving to another, the pirate finally showed up. We fought and it was over quickly. I looted the “Production Assistant” and returned to the station to finish the mission. My reward for completing this series of missions was an Iteron. I had to buy the skill book that allowed me to pilot this ship, and train to level 1, but when I finished I undocked briefly to check it out. It’s a Gallente industrial ship with a cargo hold of 3000 m^3. That’s a huge amount of space compared to the other ships I have! 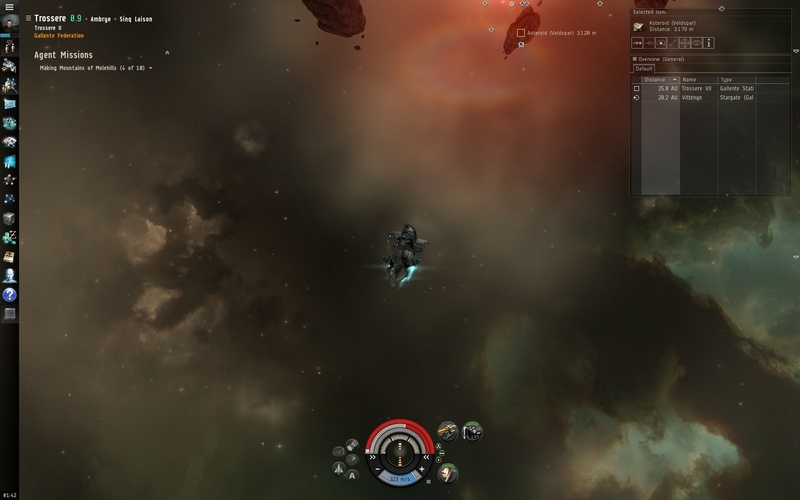 EVE has a reputation for being tough and unforgiving, but I can say first hand that at least the rookie help chat channel is friendly. Earlier when I had to mine, I glossed over the fact I had some trouble. I tried to mine but kept receiving an error “can only activate on asteroid”. Puzzled, I tried a few things and finally decided to try to rookie help channel. In other games, when rookies/newbies ask a question, they tend to get roasted. I didn’t expect much when I typed in my issue: why do I keep getting an error when I try to mine an asteroid? After a few moments, 3 different players responded and said similar things: what is the name of the asteroid? You can only mine ones that say the name of the ore, for example “Asteroid (Veldspar)”. The other kinds aren’t mineable. Look around and find an asteroid named “Asteroid (oretype)”. Amazing! The responses were helpful and friendly, and short of flying out and helping me look, great assistance. So I took their advice and zoomed out. Lo and behold, I saw another (tiny) object that was indeed an asteroid I could mine. See it in the screenshot above? (I zoomed out quite a ways to capture the size of the other objects floating around). No? I’ll circle it in red. I spent my time going back and forth between the gigantic other non-mindable asteroids that dominated the area, and didn’t notice the tiny one there in between, until other helpful players pointed out what was wrong. Now I see how to update my overview to display “collidable objects”, but that makes for a noisy display. This tutorial series started out with mining. 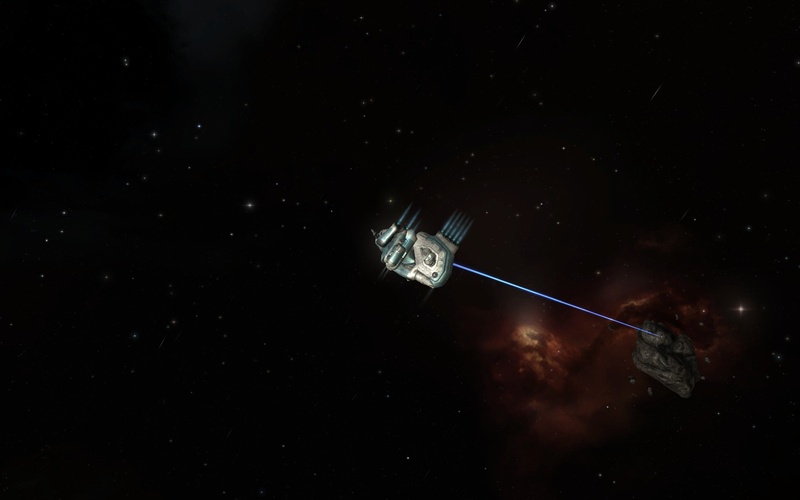 So I fitted the provided mining laser and warped out to a nearby asteroid belt and started up. After a few minutes, I had enough ore to complete the mission so I returned to station. The next step involved getting more ore and refining it… I checked and I mined enough on my previous trip I didn’t have to undock and get more. My reward was another ship: the Navitas. Yay! The mission after that was to use blueprints to build Civilian Afterburners. I had to work slowly to figure out where in the UI I had to go for the information I needed. The first step was locating the blueprints, which appeared in my item hanger. Right-clicking, “Show Info”, and then “Bill of Materials” listed out what I needed to make it. The skill needed was “Industry level 1” (which I didn’t have, there was a red X) and the Materials needed was “Tritanium” (I had 76 and needed 61). I clicked “Next” on the tutorial and Aura warned I had to relocated to a station that had “Science & Industry” services. Fortunately the one I was in did have those, which is great because I didn’t want to dig out a map and figure out where I was and where the nearest facilities were. Well that is a bad result for a TUTORIAL. My guess is perhaps this skill is given in the Business sequence? In any case, CCP should fix this to provide the skill book and let people take the missions in any order; how am I supposed to know to do Business first? As far as me being stuck, well I wasn’t sure I had time to do the entire Business sequence before returning to the Industry missions. And even if I did, I wasn’t sure I would receive the skill. So I searched in the market, and found it local (same station I was in) for a reasonable price. Good thing I played EVE before and can kinda stumble through with some half-remembered info. After receiving the skill book, I had to wait ~9 minutes for it to train to level 1 so I could continue the tutorial. Again, not fatal, but certainly a poor experience in a tutorial for newbies. I took the opportunity to juggle my skill queue around, training Industry 3 times (to level 3), Mining to level 3, and then Astrometrics (my current long-term skill to make sure I don’t waste precious hours of training during the day) to level 4. Industry completed training, so I submitted the manufacturing job. It took another ~4 minutes to complete the Afterburner so I waited patiently, listening to the background music. It completed and I was able to finish up the mission. The next mission (Mountain out of Molehills 4) was basically the same – mine more Veldspar – but the agent warned of rogue drones. Hm… better fit a laser or some kind of weapon in addition to the mining laser. So I looked around and realized I don’t have a good weapon. I had the Light Electron Blaster on my Imicus (from the initial tutorial) and could swap that over, but that may not cut it. Perhaps I should do the Military missions first. Industry is listed last but REALLY, can the tutorials be that order dependent? I loaded up the Navitas with a Mining Laser, the Light Electron Blaster, and Light Armor Repairer (also from the initial tutorial). Unfortunately, the Fitting Windows said that the the Capacitor would deplete in 16 seconds. I guess that means I don’t have enough juice to run everything at the same time, or I could but only for 16 seconds… all the same I took the Armor Repairer along with me. I arrived at the Deadspace location and saw two NPC enemies in the area, both were Moth Apis. So, I started my battle sequence: orbit enemy, lock target, click to start the auto-firing. The fight went quick but I was pounded. They went through my shields and half my armor, ouch! I need to beef up a bit before fighting any more. Post Fight. I got beat up by two wimpy NPCs, but survived. The next mission was a delivery: take some electronic parts from Trossere VII, Moon 3, University of Caille, to Foves V, Center of Advanced Studies. I figured this wouldn’t be too bad, even though the ending system’s security status was 0.6. I set the destination and the route info said it was 4 jumps. I lazed out and using the Autopilot. After completing the mission, I took the next one which involved more blueprints. Or I tried to – it wouldn’t let me since I was in Foves V and the agent was back in Troserre VII. So I undocked and autopilot’ed my way back. Once I got back to Troserre VII, I decided it was a good stopping point, so I double checked my training queue (Industry to 3, Mining to 3, Astrometrics to 4; total time for queued skills was about 1.5 days – perfect) and logged off. I worked my way through the Exploration series of missions – great stuff. 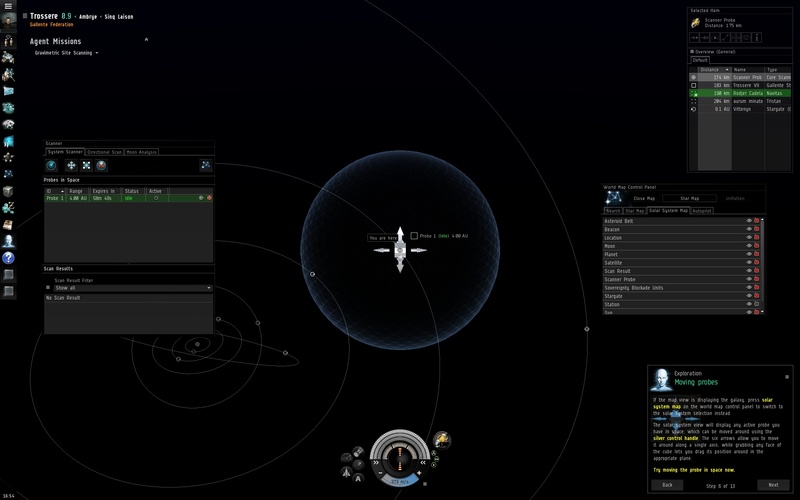 The first mission was an introduction to using the ship scanner. It wasn’t much more than scan the area for a cosmic anomaly, travel to it, pick up an item, and return. Simple, and completing within the time limit meant a nice ISK bonus. The second mission introduced more. By accepting the mission, I received a larger ship, a Navitas. It was in my cargo bay, and it took some scrutiny and memory jogging to remember that I had to “Assemble” the ship, and then board it by choosing “Make Active”. The instant I made that my active ship, the tutorial popped up a few info panes about insurance and boarding the ship. So, a little bit out of order there! I chose Platinum insurance, at a cost of ~12K ISK which would payout ~40K ISK. While I was at it, I checked my clone. My current clone level Alpha holds 900K skill points, and my very new char only has ~80K. I’ll be OK for a while on that front. Gravimetric; mining locations. Need mining gear and skills. Magnetometric; man-made “dormant” structures, ruins or abandoned. Need archaeology gear and skills. Radar; high electronic inteference, communications centers or data hubs. Need hacking gear and skills. Ladar; gas-cloud condensate areas, harvest to make boosters (drugs). Need gas cloud harvesting gear and skills. This mission was all about reading information and traveling from area to area via acceleration gate. I didn’t have to use the equipment provided in the first stage. After reporting back to complete the mission, I received my reward of 151K ISK! The goal of this mission was to scan for a Gravimetric site and return with proof. I was a little confused starting out because I wasn’t sure I had the right skills trained or gear fitted to my ship, but upon accepting the mission, an Aura tutorial popped up and said “you will need Astrometrics trained to level 1, and a Core Probe Launcher fitted to your ship”. The first mission mentioned training Astrometrics (I think the pacing of the second mission was to allow Astrometrics to complete while doing the tutorial) so I had that trained up already. I fitted the Core Probe Launcher and undocked to continue. And… I got lost. The tutorial said to use the “silver control handles” to move the probe, but I couldn’t figure out where those were, or what to click to get them to display. After clicking around for a bit (ugh!) I discovered that the other “Solar System Map” is the one I wanted. There is a “Solar System Map” tab and a “Solar System Map” button, on the Map control panel. It’s the button that displays the “silver box view”, not the tab. I think better wording would help that out as well. It took me a while to triangulate on the Gravimetric site, partly due to challenges manipulating the probes and visualizing 3D scan volumes. I finally got a 100% from the scan and warped off to the area to pick up proof that I found it. The area had some crazy looking asteroids ready for mining, plus a canister containing the proof I needed for the mission. I’m going to watch some videos that Seamus Donohue of EVE University makes available – there is a series on the tutorial missions. The instructions provided in-game are adequate but I think some tips from the EVE Uni video series will also be really helpful. The EVE University videos were fantastic and I picked up a lot of tips for Exploration and moving probes: shift- and alt- (or option-) click to move/control probes is very useful. Orbiting the station while scanning, to avoid slowly flying out of the solar system, is also a great tip. With this new information I went to practice in the next mission. Unlike the video, I did each scan separately, which takes longer, but I could use the practice doing it. I took me several minutes to close in on the location, but I finally did it. The area had some floating space junk but I was just there to retrieve my proof of discovery. This time the goal was to scan for a Radar site. I was provided with a Civilian Codebreaker, used to bypass security on the electronics systems inside. In this training area, it is risk free. However, in a real Radar site, failure to hack might alert owners to my presence. I’m getting a bit faster; this scan only took half the time of the previous one. Most of that is due to handling the 3D view better as far as positioning probes, and moving them as a group. 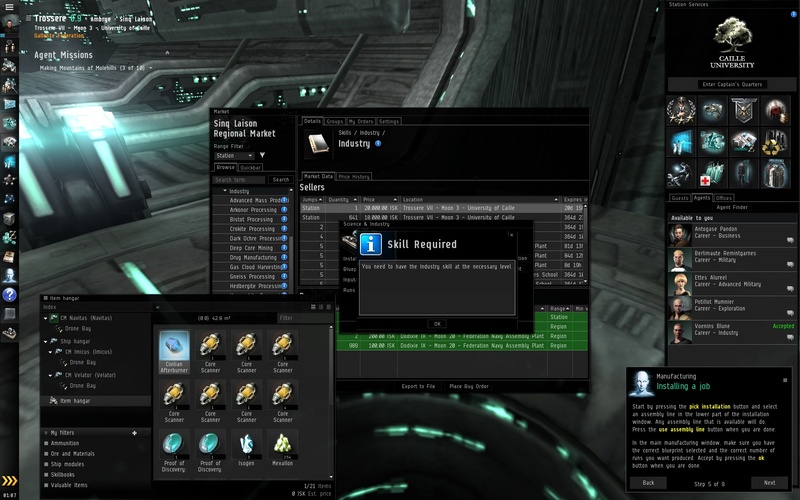 My mission reward was ISK and a skill book: Astrometric Pinpointing. I can’t train that until I train Astrometrics to level 4. The final exploration mission was to scan for a Ladar site. These are the Gas Cloud Harvesting sites. I had some trouble zeroing in on the location… need more practice with probes and optimum triangulation setups. I narrow the location down to two points, meaning 3 probes can see it in their sphere, but screw up the next step and lose the signal, for some reason. To help, I disabled a few of the probes and concentrated on getting their sphere to overlap the circles (when 2 probes detect a site) or the yellow points (when 3 probes detect a site). 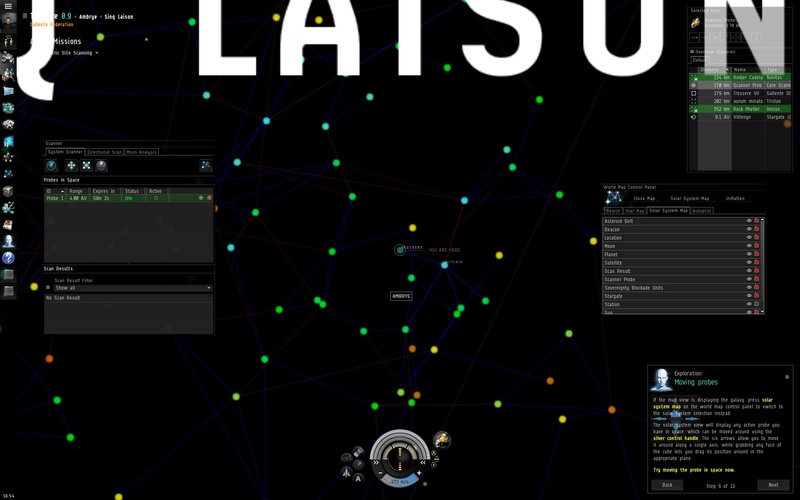 This worked pretty well and I finally found the Ladar site for this mission. I finished up and received another ship, an Imicus! I couldn’t resist undocking and flying around enough to take a screenshot or two. It is very worth while doing these tutorial missions. The ones I have left are: Military and Advanced Military, Industry, and Business. I’ll probably do Industry or Business next, and save the Military ones for when I have enough time to do both. New Ship, the Imicus. Trossere VII is the space station in the background. The more I think about it, exploration is brilliant. I haven’t even used it outside the intro missions (yet) but the overall mechanism is simply brilliant. Not everyone might find it fun, but I think it fits EVE perfectly: it boils down to puzzle solving to find the correct place to go. That puzzle blends real-world technologies (satellites, geolocation) with abstract math (intersection of spheres), jazzed up with EVE sci-fi tech (scan drones) and skills (astrometrics and astrometric pinpointing; basically raising the limit on the number of drones you can deploy and their scan error). Think about a typical MMO that wants to make an exploration puzzle to find a dungeon. Eventually the solution will be posted online. 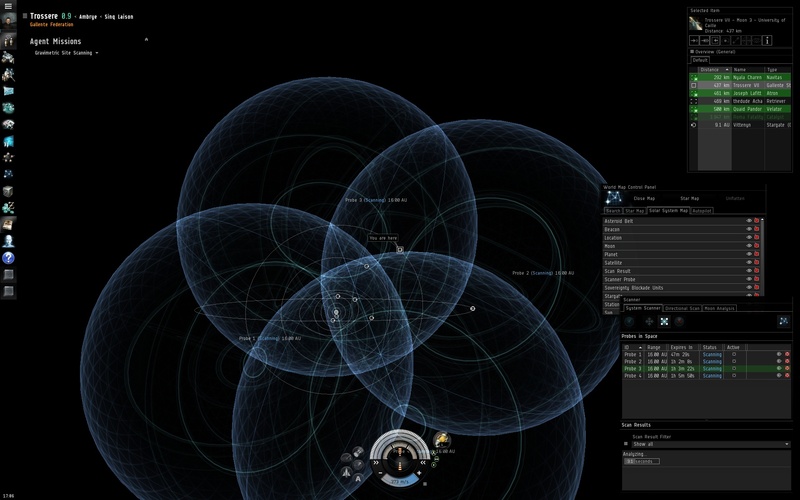 However, for exploration in EVE, the locations (puzzle solutions) aren’t fixed, they move around periodically. You can’t just solve the puzzle for everyone forever, or even for yourself (bookmarked locations will eventually become worthless) – somebody who want to find an exploration site needs to do the steps. That’s just brilliant design and implementation.